Big Poppa Eats: Memorial Day Weekend tip - Mad. Sq. Eats. Memorial Day Weekend tip - Mad. Sq. Eats. Memorial Day Weekend is finally here. Ehh. Normally this is the starting gun for summer in NYC. Unfortunately, the gun can't shoot because it is only 45 degrees and soaked from the rain. For those of you staying the city instead of running out to the beach or the mountains, I have a suggestion, assuming the sun comes out of course. May means Mad. Sq. Eats., the month long food market that pops up on the pedestrian triangle formed by Broadway, 5th Avenue and 25th Street. Just across the street from Madison Square Park, Mad. Sq. Eats. packs a lot of great food in a small area. Local restaurants like ilili and The Cannibal have stalls as well as NYC restaurants like Roberta's and Calexico. Food market favorites include Mayhem & Stout, La Sonrisa Empanadas, Asiadog and Red Hook Lobster Pound. Deserts and well represented with People's Pops, Stuffed Artisan Cannolis and Melt Bakery (ice cream sandwiches). A bonus at Mad. Sq. Eats. is that a number of the stalls are licensed to sell beer and other adult beverages. On my last visit I hit one of my favorite vendors, Hong Kong Street Cart. They have a special right now that should not be missed. 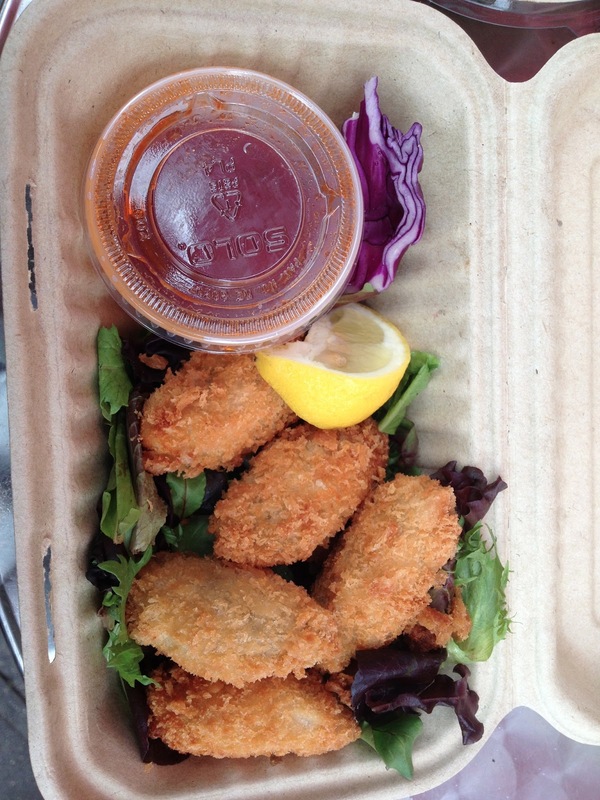 Fried Oysters. Five fresh, plump oysters are coated in panko and quick fried. They are served with a fantastic honey-sriracha dipping sauce. The oyster are hot, crispy on the outside, light and briny on the inside. This dish takes fried clams to the woodshed. Get them while you can. I also had their cold noodles with peanut sauce. Really, really good dish, especially on a hot day. Spinach noodles, similar to fettuccine, are cooked to just al dente so they are nice and chewy and stand up well to the delicious peanut sauce. If you like this dish, this will be one of your favorite versions. Mad. Sq. Eats is popular and can get packed, but don't let the lines fool you. Because of the compact area they seem longer than they are. 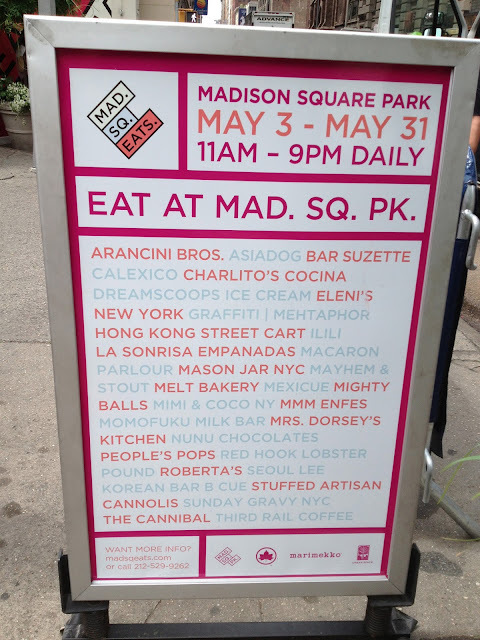 If you aren't convinced, take a look at the line at Shake Shack in Madison Square Park or just try to walk into Eataly. If the tables are all taken, pop across the street to one of the two other pedestrain areas with seating or, better yet, go find a bench or table in Madison Square park and enjoy a real al fresco dining experience. You can check out Orly Genger's momumental rope sculptures while eating your lobster roll. Hopefully the sun will come out and we can get summer started. 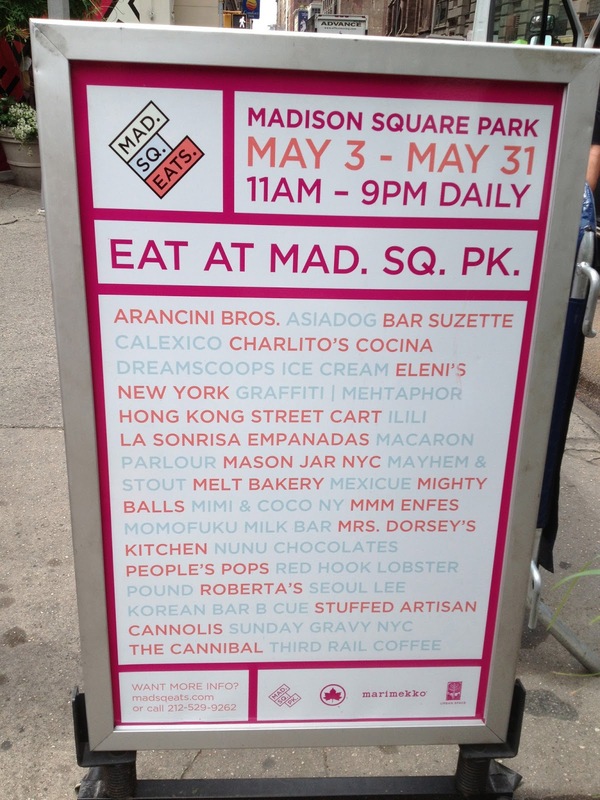 If you are in the city this weekend, check out Mad. Sq. Eats. It ends on Friday, May 31st, so this may be your best shot. My guess is the crowds will be lighter. Even if they aren't, it is worth the small wait.